Just realized a new way to use the fifo to avoid duplicated data. Instead of routing all the data to the fifo, I will route just gyro.x – so 2 bytes. 3. read all data from the fifo and discard it. This has the advantage of not relying on a certain packet structure in the fifo and is immune to fifo overflow issues. I will test it on sunday and see how it works. The ideal way to read data from the mpu is with an interrupt. I cannot do this as the interrupt pin is not connected on the crius board. So I’m polling the imu at 1Khz hoping the data is ready but as it turns out, the avr and the imu clocks don’t exactly match. For this reason I sometimes get the same sample twice in a row or skip a sample. This results in errors in the gyro integration – a 90 degree rotation in one axis is interpreted as a 89 or 91 degrees for example. FIFO to the rescue. The mpu6000/6050 has a built in fifo that you can interrogate regularly. By polling the fifo counter I know if enough data has arrived and read it – or if not enough just wait for it. The problem is that the FIFO – being a First In First Out buffer – can be read only from the back – the oldest data. And if the buffer overflows (it has 1024 bytes) the oldest data gets discarded. For this reason I have to make sure that the data packet size is a divisor of 1024 so that when a new packet arrives and overflows the 1024 bytes buffer, it discards one entire packet and not a fragment only. My packet has 14 bytes right now – 6 for the accelerometer, 6 for the gyro and 2 for temperature – so whenever there is an overflow I get corrupted data from the fifo as I’m not reading whole packets anymore – but some data from one and the rest from the next one..
My temporary solution is to throw away data from the fifo whenever there’s too much in it – say more than packet size * 10. This solved most of the too-much-rate problem but not entirely. I still need to debug it a bit more..
By removing the rate pid from the crius, sending quantized data instead of floats through the serial port and compiling with -DNDEBUG to remove asserts I managed to send data at 1000Hz. I can go up to 1800Hz but since the MPU6050 can sample at max 1000 there’s no need for that. Good to know that I still have extra CPU for when I’ll add the GPS code. So 1000Hz is possible through a serial port at 5000000 baud, with cpu to spare. 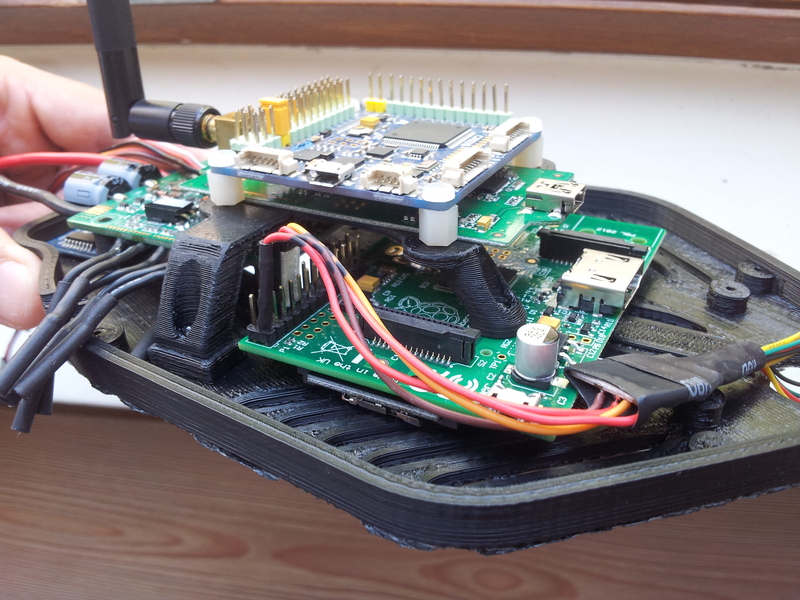 I finally have the ground station (gs) talking to the brain (raspberry pi) and the io_board (crius/avr). 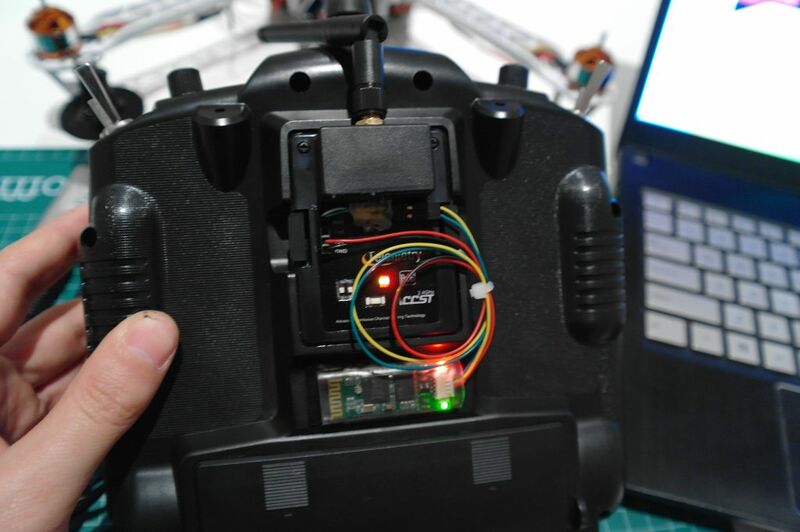 I get sensor data, can calibrate the accelerometer/gyro/compass, send uav and camera input and so on. 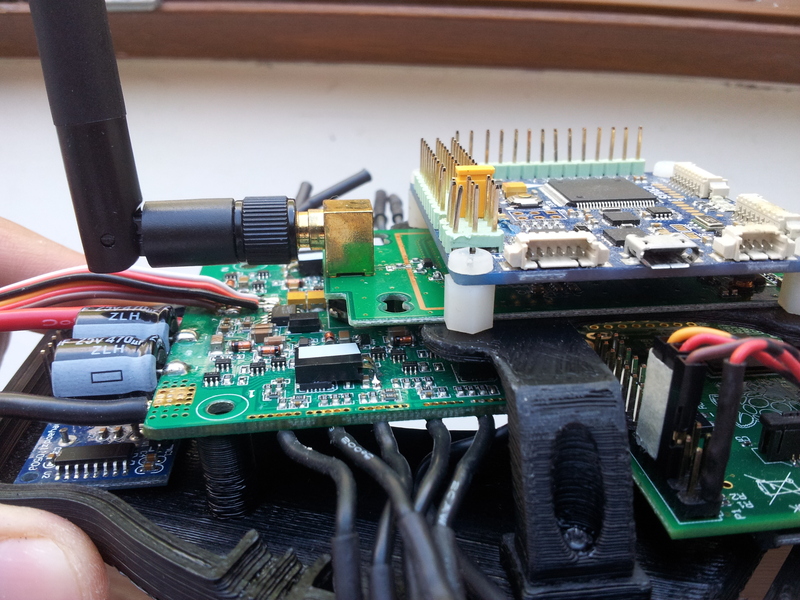 The io_board sends sensor data at 500Hz to the brain and also runs a rate PID at 250Hz. Motors are mixed on the io_board using a throttle input from the brain. The brain will do AHRS at 500Hz using the sensor data from the io_board and it forwards data to the gs at 30Hz. The next step is to get the io_board simulation working again to be able to test the rate pid, stability pid, motor mixer and GS. 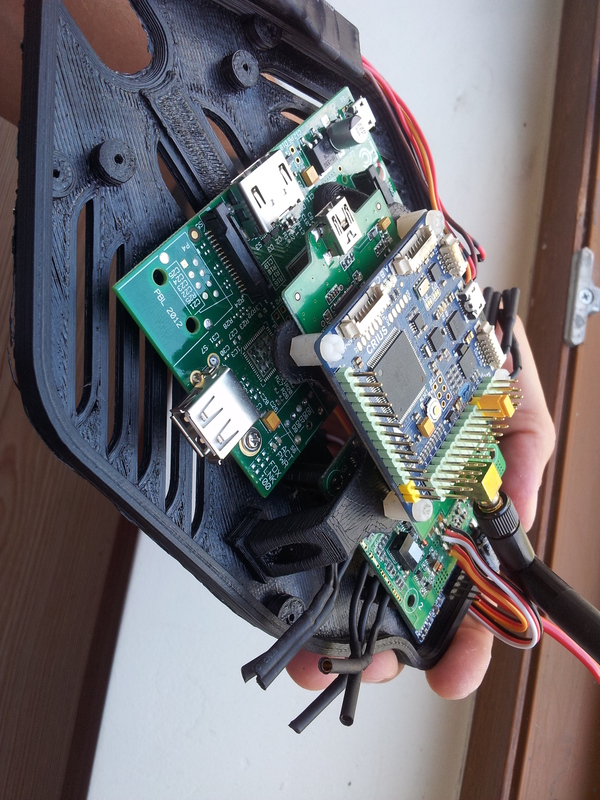 This project allows you to send telemetry data from a megapirate board through a 2-way frsky link back to the Ground station TX, where it gets decoded and merged over the video feed. I ordered a new frsky telemetry rx/tx from hobbyking a month back and while waiting for it to be shipped – 3 weeks to spain – I started reading about the telemetry protocol they use. It seemed like such a useful thing to be able to send data back to the GS. 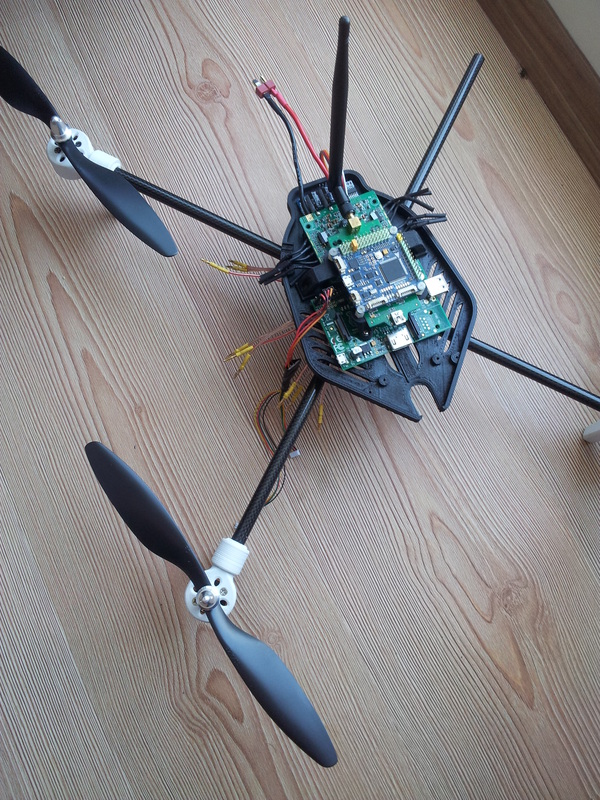 My first thought was to remove the OSD form the quad and put it in the ground station. I’d save a few grams of weight and I would get all the range of the frsky radio instead of the measly ~200m range I’m getting with my 5.8Ghz video tx (in the meantime I improved this with a 4-turn helical). The only thing I had to do was plug serial 3 with the mavlink data stream from my crius aiop into the frsky receiver on the quad and get it from the th9x, plug it into the minimosd in the GS and voila! a more reliable OSD. 2. 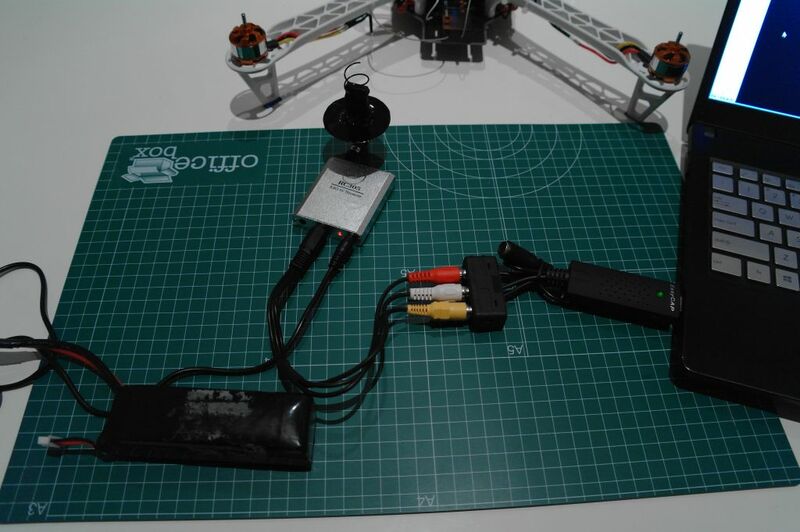 The frsky tx and rx use 232 levels while aiop and minimosd uses TTL. This requires 2 level inverters – and I only ordered one from HK. 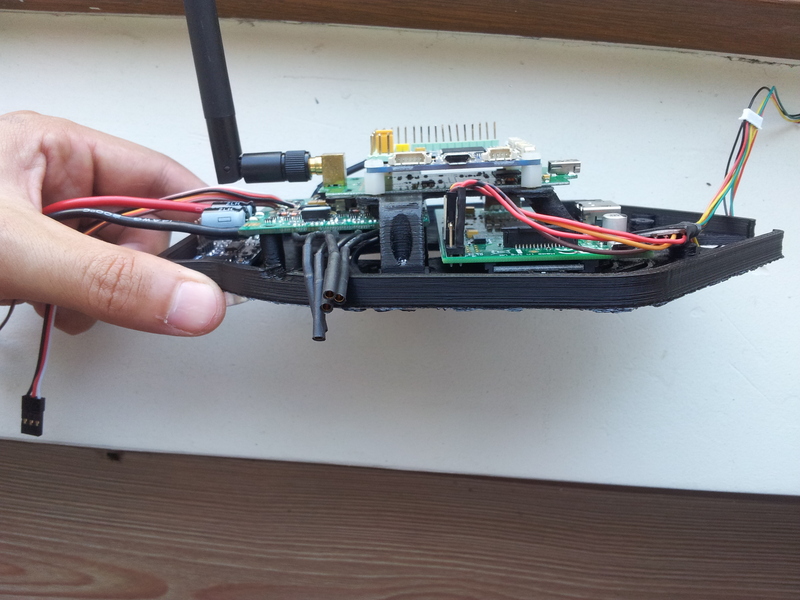 The first problem could be solved with two mavlink <-> frsky protocol converters and there are a few projects for this (http://diydrones.com/profiles/blogs/adding-more-features-to-ioboard). The other alternative was to write a new protocol that compresses the data to fit in the 1200bps limit and decode it at the GS end. I had to disable the serial3 mavlink from mgapirate and plug my own function in the update loop. To save bandwidth, the info is split in packets (motors, altitude, rc inputs etc) and each packet is sent only if it changed (so delta compressed). Together with quantization, I managed to pack everything I wanted (except GPS – still waiting for it to arrive). The result is real-time update for the important things – altitude, heading, motors (to graph temperatures). The refresh rate depends on how much things change in time – and it turns out that most data is pretty stable so I usually get 15-20Hz – way more than my initial estimates of 2-5Hz that I would get without the compression. 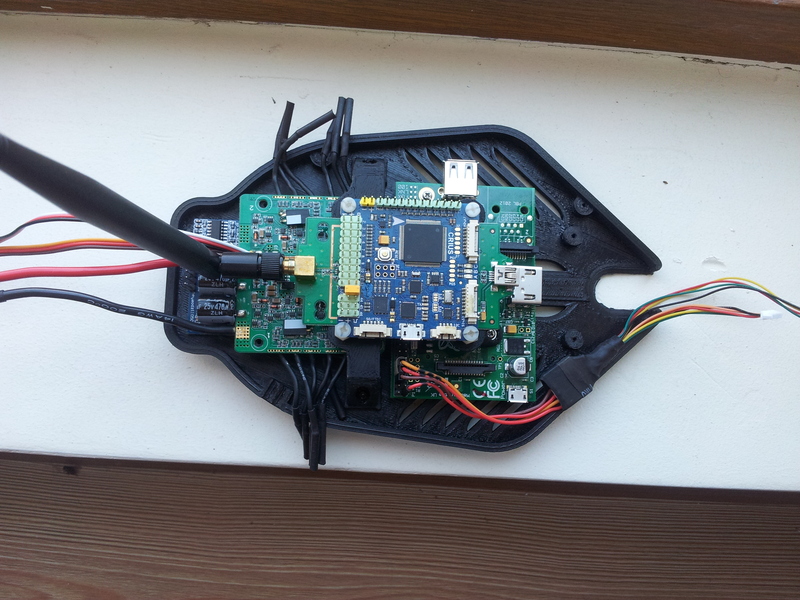 For the second problem – I found a way to hack into the TX and get TTL levels out of it directly (http://projects.onomato.biz/projects/android-dash/wiki/BlueTooth). Then connect this to a serial bluetooth adapter and voila – telemetry straight to my laptop or phone. 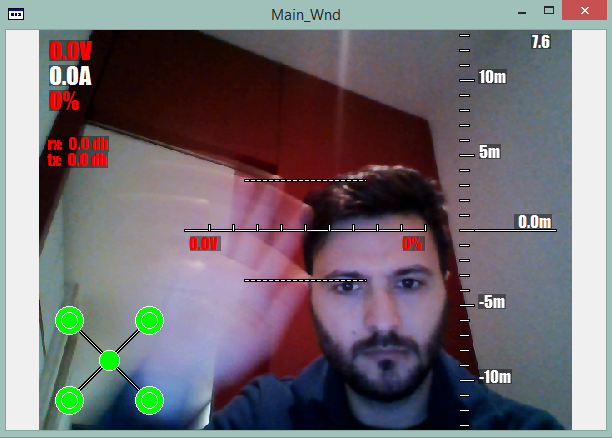 With a small QT+opencv application I can have the camera feed on my laptop combined with the rendered telemetry values in a nice HUD. The app supports 2 deinterlace methods (bob + some other type that I forgot) and recording using a user chosen codec. The interaction happens with shortcuts – no menus for now – and is pretty crude. I’ll soon add support for touchscreen as I got a HP Omni tablet and that will replace my laptop in the GS. Battery life is great on the tablet (6-9 hours) and the CPU is way stronger than to my old eeepc 901. Call the ct_process() function from static void gcs_data_stream_send(void). Of course, this assumes you have a easycap with the drivers installed.